Congratulations to Linda Dimas and Jeannie DeMarte, our April Employees of the Month! 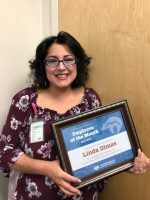 Linda Dimas, in Prior Authorizations, has gone above and beyond to help a patient who was experiencing multiple issues with her insurer to get authorizations in place for a referral. She worked with the patient, the insurer, radiology, and the other medical center to make sure everything was addressed, so the patient could get the care that she needed. Linda really exhibits great teamwork! Congratulations, Linda! Jeannie DeMarte has been part of the Clinical Research Office (CRO) for almost two years, and we’ve been lucky to have her! Her extensive and varied background in data management has allowed her to approach problems in a confident and thoughtful way, and this has benefitted our office time and again. Jeannie was instrumental in the recent upgrade of the Velos application used at the Cancer Center and by the New Mexico Cancer Care Alliance sites. She has re-tooled and improved several reports used for tracking metrics. Most importantly, Jeannie is patient, kind, and professional with those who come to her for assistance, and she treats everyone with respect. We’re all very happy with what she’s accomplished, and Jeannie’s upbeat attitude and strong work ethic make her a valuable CRO team member!